2015 I WRAPS I 79 Cast vs. Calendar I had always assumed that installers everywhere wrapped vehicles with premium cast film. What a shock I had when I did my first demos and workshop in Brazil. 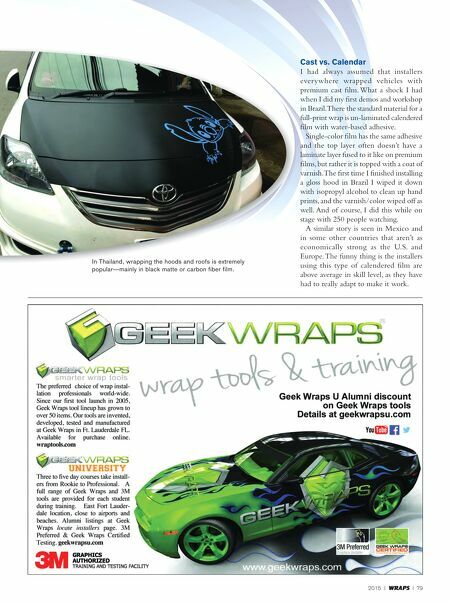 There the standard material for a full-print wrap is un-laminated calendered film with water-based adhesive. Single-color film has the same adhesive and the top layer often doesn't have a laminate layer fused to it like on premium films, but rather it is topped with a coat of varnish. The first time I finished installing a gloss hood in Brazil I wiped it down with isopropyl alcohol to clean up hand prints, and the varnish/color wiped off as well. And of course, I did this while on stage with 250 people watching. A similar story is seen in Mexico and in some other countries that aren't as economically strong as the U.S. and Europe. The funny thing is the installers using this type of calendered film are above average in skill level, as they have had to really adapt to make it work. 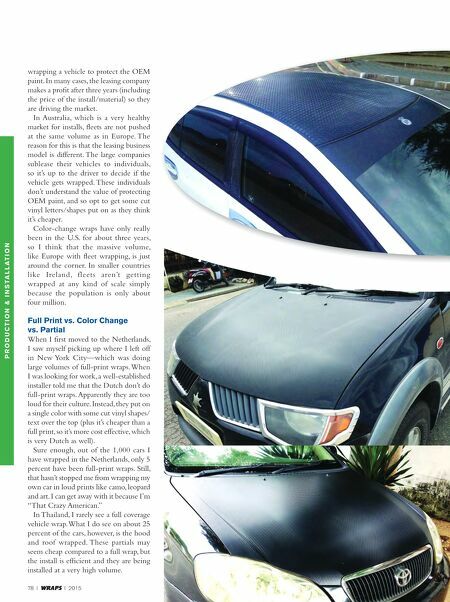 In Thailand, wrapping the hoods and roofs is extremely popular—mainly in black matte or carbon fiber film.